Redesign Pokedex. 138 “new” (replacement) species of pokemon from all regions . Replacements are based on design and/or qualities/features of each Pokemon. Example, Rattata is replacement for Zigzagoon . 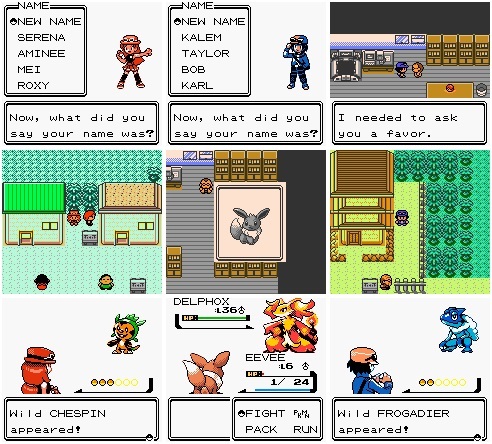 Different species of wild Pokemon and Pokemon trainers, while maintaining a logic . Update priorities moves. Extreme Speed ​​now has priority over Quick Attack. Properities of healing items (potions, berries…) edited so that said items can’t be used in the middle of a battle. However, no changes in the functions of the items when held by a Pokemon (berries still heal, etc.). Stat and type boosts provided by badges removed in order to give the game a more “professional” feel and increase the difficulty by removing an unfair advantage. Partial translation of rom to spanish ( I’m a Mexican Hacker). Halved the steps for an egg hatches of all Pokemon. This is intended to encourage the breeding. ** The effect of U-turn is a mix with Batton Pass, so it is considered incomplete…. In Goldenrod City, you can get via trade the Chamber’s Ditto with the quality of being shiny (If a Parent of an egg is shiny, there’s a probability of 1/64 of that breeding is also shiny). 1.-Where I can find the evolutionary items? 2.-Where I find and which are the Move Tutors?